How did the elements on the periodic table get produced? 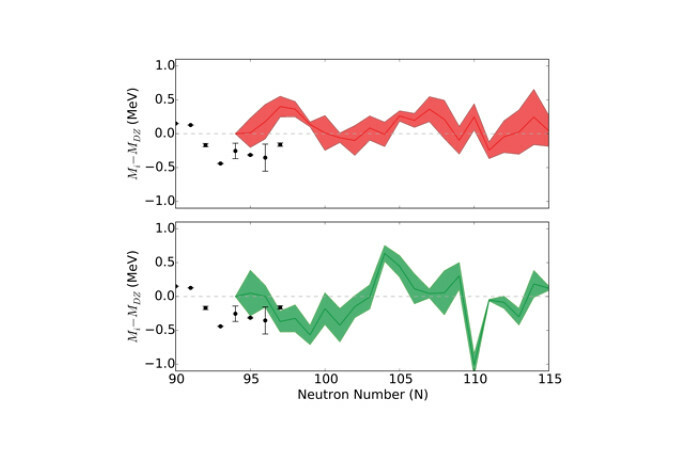 Shown in red and green are two possible predictions of neodymium (proton number 60) nuclear masses from the reverse engineering technique. The difference in these predictions comes from the unknown astrophysical conditions present during the formation of the heavy elements. Soon, experimentalists will be able to push their measurements (currently shown by black dots) all the way to the right on these graphs. If the future measurements follow the red or green trends, scientists will gain insight into where the heavy elements are created in the universe. Scientists at Los Alamos National Laboratory have recently developed a new method to tame these troubling uncertainties. Los Alamos scientists are guiding experimentalists to the right place. At nuclear science labs around the world, new accelerators are being developed to answer a fundamental problem in nuclear astrophysics: How did the elements on the periodic table get produced? Experimentalists use these accelerators to mimic the conditions in the universe where nuclear reactions create the heavier elements beyond iron. One of these processes, the r-process, occurs in very short time periods on the order of several seconds. It is believed to occur in violent explosions such as supernova or the collision of two neutron stars, astrophysical events that release tremendous amounts of energy and matter. In the r-process, the formation of the elements is so neutron-rich that many of the participating nuclei have been impossible to reproduce in the laboratory until now. The r-process cannot be directly observed, so it must be simulated on a computer. Nuclear models are critical inputs that go into theoretical simulations of the r-process. These models have large uncertainties since there is no experimental data to help guide them and thus prevent scientists from determining exactly how the heavy elements are created. Scientists at Los Alamos National Laboratory have recently developed a new method to tame these troubling uncertainties. In addition to experimental data, they use observations of the elemental abundances in the sun and meteorites to further constrain nuclear models. This Bayesian inference technique reverse engineers nuclear properties from astrophysical observation allowing for new theoretical predictions. This procedure is repeated for different possible r-process locations (supernovae, neutron star mergers, etc.) and unique solutions are found for each one. Those solutions are measurable in the laboratory. With that knowledge in hand, experimentalists can fine-tune their measurements to look for these signatures. The combined theoretical and experimental effort will point to where the r-process is occurring in the universe and will help to answer one of the most difficult open problems in all of physics: what is the origin of the elements? Matthew Mumpower at Los Alamos National Laboratory, Gail C. McLaughlin from North Carolina State University, Rebecca Surman from the University of Notre Dame and Andrew W. Steiner from the University of Tennessee Knoxville and Oak Ridge National Lab did this work. The National Science Foundation and the US Department of Energy provided funds for this work. The paper referenced is The Link Between Rare-Earth Peak Formation And The Astrophysical Site Of The R Process.